The judgment which is expected by the students of human rights jurisprudence has finally come. The Supreme Court has granted relief to the three convicts in the Rajiv Gandhi assassination case, Murugan, Santhan and Perarivalan, by commuting their death sentence into life term on the grounds that the 11-year delay in deciding their mercy petition by the Central government had a dehumanizing effect on them. According to the apex court bench headed by Chief Justice P. Sathasivam, the delay was not only excessive but also irrational and unexplained. The court while delivering its verdict stated that the life imprisonment would mean life in jail till end. The Union’s contentions that the three convicts did not deserve any mercy as they never showed repentance for the killing of the former Prime Minister and they enjoyed their prison life, were rejected by the three-judge Bench. The Bench, after considering the fact that the convicts were suffering jail for nearly 23 years, gave a positive response for their release by stating that the State government could use its remission powers under Section 432 and 433 and following the due procedure in law. The court expected that the government would render advice in reasonable time to the President for taking a decision on mercy pleas and has asked the government to add a new criteria for considering commuting death penalty to life imprisonment, ie the excessive delay in deciding mercy petitions. The Centre had strongly opposed their plea stating that it was not an appropriate case for the apex court to commute death sentence on the ground of delay in deciding mercy plea. The government, however, admitted the fact there has been delay in deciding the mercy petitions, but at the same time argued that the delay was not irrational, unexplained and unacceptable to commute death penalty. As per Livelaw reports, on January 21 a three Judge Bench of the Supreme Court issued landmark guidelines relating to Death Penalty, while allowing all the 13 Writ Petitions filed by 15 Death Convicts in various cases. The Bench consisted of Chief Justice P.Sathasivam, Justice RanjanGagoi and Justice Shiv Kirti Singh commuted the death sentence imposed on Suresh, Ramji, Bilavendran, Simon, Gnanprakasam, Madiah, Praveen Kumar, Gurmeet Singh, Sonia, Sanjeev, Sundar Singh, Jafar Ali, MaganLalBerala, Shivu and Jadeswamy. “Right to seek for mercy under Article 72/161 of the Constitution is a constitutional right and not at the discretion or whims of the executive. Every Constitutional duty must be fulfilled with due care and diligence; otherwise judicial interference is the command of the Constitution for upholding its values”. “Remember, retribution has no Constitutional value in our largest democratic country. In India, even an accused has a de facto protection under the Constitution and it is the Court’s duty to shield and protect the same. Therefore, we make it clear that when the judiciary interferes in such matters, it does not really interfere with the power exercised under Article 72/161 but only to uphold the de facto protection provided by the Constitution to every convict including death convicts”. In May 2012, the apex court had transferred to itself the writ petitions filed by three convicts in the Madras High Court challenging the rejection of their clemency plea by the former PresidentPratibhaPatil after 11 years, which was stayed by the High Court on August 30, 2011, staying their execution. The CJI while writing the judgment said the principles had already been laid down by this court in its judgment on January 21, that undue and unexplained delay would be a ground for commuting death sentence into life imprisonment. In this case the only question to be decided was whether the excessive delay was aninterrupting circumstance and whether the delay was initiated at the request of the accused. Mentioning the stand of the Centre that the convicts were enjoying their prison life and they did not suffer any torture, the Bench said there was no legal compulsion on the accused to prove physical torture. Such an analysis was not known to and it would not be possible for death row convicts to prove that they suffered torture. The Bench further stated that the law did not require proving actual harm suffered. The Bench held that it was evident by the materials on record that several letters were being sent by the convicts to the President and they even reminded the President which remained unheard. This clearly showed the unbearable torture suffered by them. The court further stated that there is nothing in Indian law and international law that puts the burden of proving torture and dehumanizing condition on the death row convicts. The Bench said through mercy petitions convicted prisoners are hopeful and just because there was no time limit fixed for disposal of mercy petitions, the executive should not sit over these petitions and advise the decisions to the President within a reasonable period for arriving at an early decision. The Bench said the court did not gain any pleasure in judicial review of the decisions taken by the President. The petitions were allowed by the Bench and commuted the death sentence of three death row convicts into life imprisonment. As per reports, soon after the verdict, General Secretary of MDMK Vaiko, who was present in the court called it as an historic judgment and said that this judgment would go down in golden letters in judicial history. He appealed to the Tamil Nadu Chief Minister Jayalalithaa to consider the judgment and order the release of the three convicts exercising the State government's powers under Section 432 Cr.P.C. The bench headed by Chief Justice P Sathasivam earlier had rejected the plea of the Centre, which prayed for posting the case for another day. Senior Advocate Ram Jethmalani appearing for the condemned prisoners-Santhan, Murugan and Perarivalan, said he has serious doubts that the government was trying to delay the case so that they can file review petition on apex court verdict holding that delay in deciding mercy plea can be a ground for commuting death sentence. According to Additional Solicitor General SiddharthLuthra, the Centre was considering for pursuing review of the recent apex court verdict in which it held that unwarranted and strange delay by government in deciding mercy plea of death row convicts can be a ground for commuting their sentence. Rajiv Gandhi was killed in 1991. In January 1998, a TADA court convicted his assassins who were awarded death sentence, and the apex court on May 11, 1999, confirmed their death sentence. 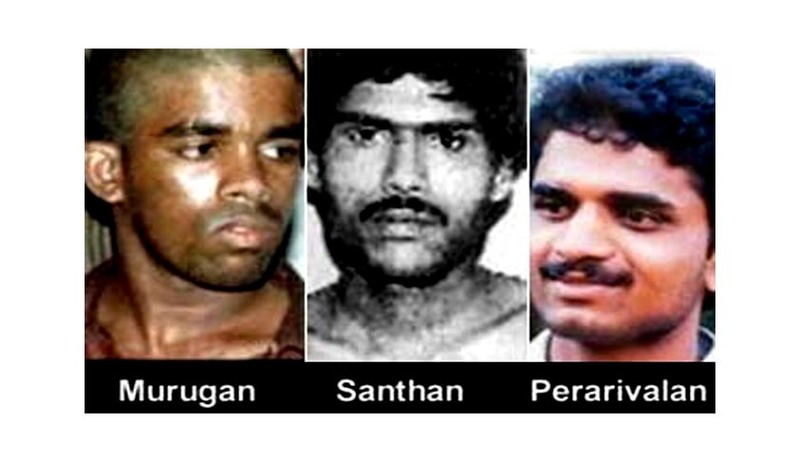 The three assassins - V. Sriharan alias Murugan, A.G. Perarivlan alias Arivu and T. Suthendraraja alias Santhan - sought the commutation of their death sentence to life imprisonment on account of the excessive delay of nearly 11-years in deciding their mercy petitions. Live Law reported a controversy, according to which the media on 24th Nov 2013 reported under the caption ‘Former CBI official says he did not record Perarivalan’s confession verbatim’. Mr. V. Thiagarajan, IPS (retired), who was the then CBI Superintendent of Police of the Kerala Branch said that he was assigned the task of recording the statement of accused persons in the Rajiv Gandhi assassination case in 1991. The Hindu reported, “A documentary released by the People’s Movement Against Death Penalty (PMADP) claimed that the CBI had failed to record verbatim the confessional statement of A.G. Perarivalan @ Arivu, the convict facing death penalty in the Rajiv Gandhi Assassination Case. Mr. V. Thiagarajan was quoted saying that “Arivu told me he did not know why they asked him to buy that (battery). But I did not record that in the confessional statement. Then the investigation was in progress, so that particular statement I did not record. Strictly speaking, law expects you to record a statement verbatim… we don’t do that in practice”.It was also reported that he said, “If he did not know that there was going to be a killing, how can you make him party to the killing. It is illogical; it is against the evidence on record. Therefore, you look at it from any angle it will be miscarriage of justice if the extreme penalty is carried out”. It appears that Mr. Thiagarajan’s concern is confined, i.e. only when the accused is visited with extreme penalty. What about the prolonged incarceration and the ordeal, not to live but merely exist as candidate of death. Perarivalan’s mother Arputhammal was quoted saying that “the imprisonment of Perarivalan @ Arivu for over 22 years was unjustified since the conviction was based on a confession statement that lacked clarity and facts”. The above said revelations of former CBI official, Mr. Thiagarajan is an admission of guilt by the officer concerned about his intentional omission and commission, which would attract various offences enumerated in Chapter IX and XI of the Indian Penal Code, viz. Sections 166, 167, 193, 194, 195, 196 etc. Section 194 says, “Whoever gives or fabricates false evidence intending thereby to cause or knowing it to be likely that he will thereby cause, any person to be convicted of an offence which is capital by the law for the time being in force in India, shall be punished with imprisonment for life or with rigorous imprisonment for a term which may extend to ten years and shall also be liable to fine”. The commutation is a great solace to those who doubt the very involvement of convicts in the assassination, owing the conflicting reports coming from the very officers who investigated the offence.